I finally had a few extra minutes to grab the trail from my GPS for the flight that Dave, Jess & I took last week. I also want to add that the feeling David told me about -- panic on the first takeoff roll -- is the same feeling I had when Rich took me on my first flight back in October 2005. I remember a combination of exhilaration while simultaneously feeling "OH NO, I DO NOT WANT TO DO THIS -- LET ME OUT!" Like Dave, I contained the feeling, the panic faded, and I was left with the exhilaration. 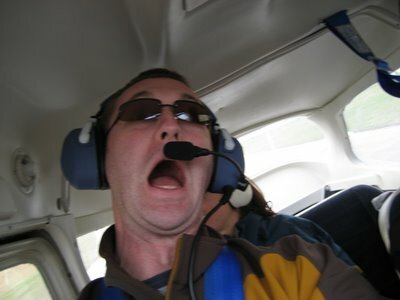 I think this kind of trepidation is normal for anyone who hasn't spent time in a small plane. We started off with David in the right seat and Jess in the back. They got settled in while I conducted the preflight and went through my pre-start checklists. Part of David's preparation was to make a visual record for the NTSB in case of a crash. He figured that if his camera was recovered from an accident scene, it would provide some documentation of the plane's "last seconds." At least, that was his explanation for this photo. In reality, though, I think this is a reflection of how he was feeling even though the plane hadn't moved from its parking spot. We flew North over Sugarloaf Mountain and then West for a view of Harper's Ferry. Dave and Jess, along with my brother Wes and friend Ryan, drove down to Harper's Ferry several years ago to hike a portion of the Appalachian Trail, so the view had special meaning for them. In significant part, it was depressing to see how close residential development encroached on the forest through which the trail ran. While they had felt secluded and "miles from civilization," the aerial view showed that there were houses just a couple miles each side of the trail. The air was smooth, and after flying over Harper's Ferry, we turned North to follow the Potomac up the valley for a while. It was great flying, and both Dave and Jess were impressed with the smoothness and feeling of stillness even though we were making a ground speed of about 130 mph. 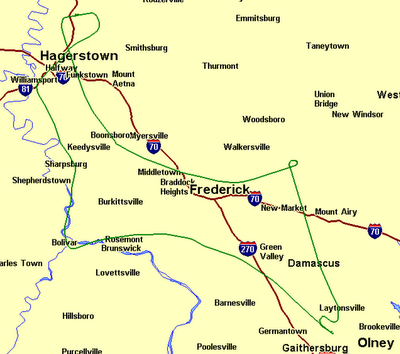 I asked them if they'd like to land somewhere, just to get a sense of distance, and they did, so I headed toward Hagerstown and called the tower as I approached the Class D airspace. I was told to enter a left base for Runway 27, and then cleared to land. There was a 9 knot crosswind blowing from 330, sixty degrees off the runway. Crosswind landings are something that it seems every pilot needs to keep working on, and I'm no exception. The technique it to tip the upwind wing into the wind, then keep the plane straight with opposite rudder. This has the plane approaching the runway with one wheel tipped lower than the other. (There are other techniques, but this is the one I like best.) My tendency has always been to level the wings just before touchdown, which then results in a drift off the centerline of the runway. This time I was determined to do it right, and I held the "slip" all the way through the flare and touched down right wheel first. It was a smooth landing, and both Dave and Jess said it was a good one, though David later told me that he thought the one-wheel landing was unintentional. We stopped the plane at Rider Aviation, and used the bathrooms. It was nearing dark, so after using the posh facilities, we piled back in the plane, with Jess in the right seat and David in the back. We took off on Runway 27 and headed Southeast toward Gaithersburg. Jess steadied the controls and held the plane straight and level while I flipped a chart to get some frequencies I needed for our approach back toward DC. We flew over the Frederick airport at 3,000 feet and watched an airplane approach to land below us, then turned East while I waited to get a transponder code to reenter the ADIZ. It was fully dark now, and the lights on the ground were sparkling as I cruised slowly between Frederick and Westminster. We chatted while we flew, and David told me that he had nearly panicked during our first takeoff roll, and had felt a nearly irresistible impulse to grab the controls. Both he and Jess were relaxed now, the air was silky smooth, and it was beautiful cruising with the lights from Baltimore and Washington and the surrounding areas all lit up. I circled to kill time, and Air Traffic Control then called to allow me into the ADIZ. I headed toward Gaithersburg, and listened to the weather on the radio. The wind was calm and there was no traffic in the pattern, so I set up for a left downwind on Runway 14 and triggered the runway lights. The landing was good, and we taxied back to park the plane, then headed home. A couple weeks ago, I wrote about the failure of the charging system in 35R the morning I was supposed to take my checkride. I'm a member of two flying clubs, though most of my flying has been in 35R and other planes owned by Congressional Flying Club. The Inn Flying Club has four nice planes as well, and I've done some fun flying in 92704 and 30YR, the IFC's two Cessna Skyhawks. 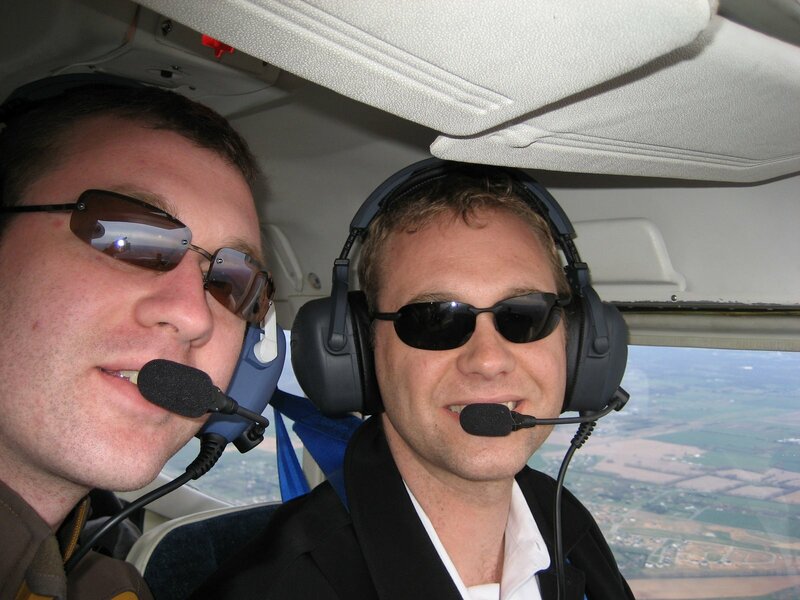 I found out, though, that while I could fly the IFC planes as a student, as soon as I passed my checkride I could no longer fly those same planes until I had a "checkout" flight with an IFC instructor. It seems a little flawed to me -- I can fly before I've proven to the FAA that I'm a safe pilot, but as soon as I've proven my proficiency, I can no longer fly until I do a checkout...? Anyway, I've been trying to schedule checkout flights with IFC instructors for a couple weeks, and finally got my chance today. 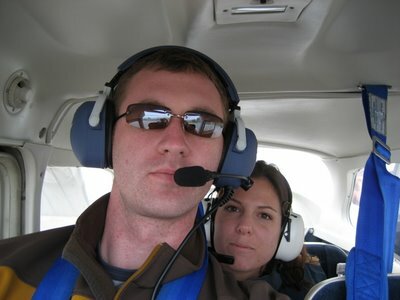 One of the flight instructors, Mark, called me in response to a pleading email and asked if I could fly this afternoon. My work day was flexible enough that I could, so we agreed to meet and do checkrides in both of the IFC planes. We met and prepared to go flying in 92704. Mark told me that he thought the plane needed a new starter because it had been hard to start. When I started the plane, I told him I thought it sounded more like a weak battery. We got our clearance and taxied to the end of the runway. When we did our runup, the ammeter was fluctuating and hovering just below the center line. When I turned the beacon off, it stopped fluctuating, but hovered below the center line. I turned off the alternator, and saw no difference. Then when I turned on additional lights, the needle hovered even a little lower. Mark was on the fence about whether we could go, but I asked him if I was PIC and said that if I was, I was not going to fly the plane without having a mechanic look at it. He agreed, and we taxied back to the parking spot. As we were getting ready to shut down the plane, the radios started making a lot of noise and all the lights on the instrument panel started fading. This is the second time in two weeks that I've had a charging system problem, in two different planes. So we flew 30YR, which is the newest plane I've ever flown and very nice. Once we were outside the ADIZ, Mark had me perform power-on and power-off stalls, slow flight maneuvers, a long forward slip (with instructions to lose 2,000 feet in altitude). We flew over Carroll County airport at 3,500 feet, and Mark pulled the power for me to circle down to land on the runway without power. I landed a little long, but without any problem. Then I did a short-field takeoff and we headed off to practice ground reference maneuvers. I did turns around a point, using a silo as a reference point, then we climbed up higher so Mark could teach me how to use the autopilot. The autopilot is something I have been excited about. This is the only plane I fly that has one, and it basically just keeps the plane flying a straight course, leaving the altitude control to the pilot. He showed me how to use it, and a little quirk it has, and we headed back toward the airport. Mark had me do a short-field landing so we could get off the runway as a courtesy to a jet that was coming in behind us, and we parked. Mark said he saw no safety issues and that he thinks I'm a very capable and safe pilot. It was a good, fun flight overall, and I can now fly 30YR (again). That makes three (including 35R and 739BA, the two Skyhawks owned by Congressional Flying Club. I'm looking forward to adding different types of planes to my roster of planes available to me. I think that's the next step in my development as a pilot, followed closely by working on my instrument rating.